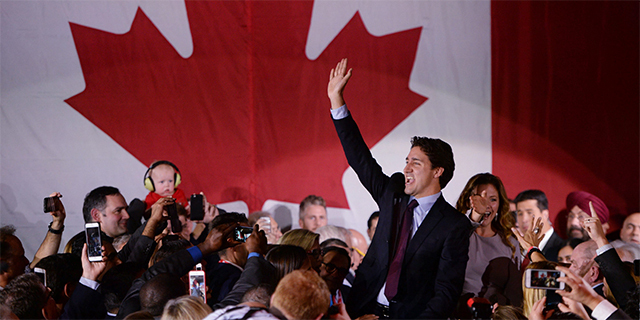 Canada’s Liberal Party captured a majority of seats in Monday’s federal election, winning enough votes to form a new government. Justin Trudeau, son of a former Liberal leader, will be the first member of his party to serve as prime minister since 2006. So, what does this mean for the U.S.’s relationship with its northern-border ally? Canada’s Liberal Party is often classified as centrist, and a recent Pew Research Center survey finds that they indeed represent the middle path on Canadian views toward the U.S. But on some key issues, like the Keystone XL pipeline and the Trans-Pacific Partnership (TPP), supporters of Canada’s Liberal Party are less supportive than their Conservative Party predecessors. On the Keystone XL pipeline, a new Liberal-run government might be less inclined to push the U.S. to approve the stalled project. While Trudeau has pledged his support for the pipeline, which would deliver oil from the Alberta oil sands region to U.S. refineries, overall support for the venture in Canada is tepid. In our most recent survey, Canadians are split: 42% favor building the pipeline, while 48% are against it. Among Liberal supporters, 45% approve of the pipeline, with a nearly identical 46% opposed. Conservative Party backers are much more enthused by the project (72% support it), while backers of the left-leaning, social-democrat New Democratic Party (22%) are least supportive. 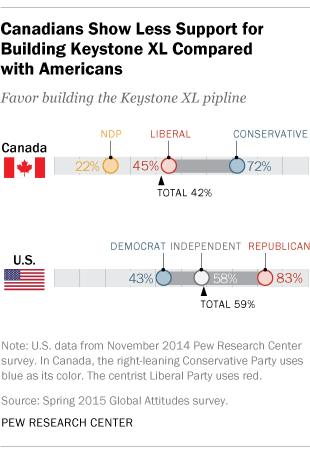 In the U.S., there’s more public support for the Keystone pipeline, but it’s largely split along party lines. According to a November 2014 Pew Research survey, 59% of Americans support building the pipeline. But there’s greater support among Republicans (83%) than Democrats (43%). TPP, a new trade agreement that seeks to reduce tariffs between the U.S., Canada and 10 other Asia-Pacific nations, has garnered public support in both Canada and the U.S. 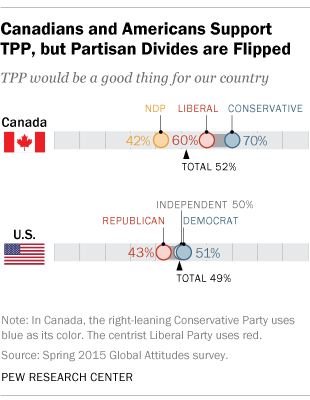 In Canada, six-in-ten Liberal supporters say TPP is a good thing for Canada, and seven-in-ten say this among the country’s Conservatives. Among NDP supporters, however, only 42% think the massive trade deal is a boon for Canada. In the U.S., 49% support the trade deal. In Canada, those who back the more liberal Democratic Party are more supportive of the pact (51% say it is a good thing for the U.S.) than are those with the more conservative Republican Party (43%). Canada’s election isn’t likely to dramatically affect overall sentiment towards the U.S. Canadians continue to have warm feelings toward Americans – 68% said as much in our spring poll. And while Liberal Party supporters (71% positive view of the U.S.) are not as pro-American as Conservatives (84%), on balance the sentiment is favorable and mutual. According to a 2013 survey, 81% of Americans hold a positive view of Canada.